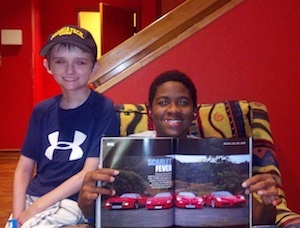 Brennan meets his good buddy Markell Gregoire at St Jude as Markell picks out four red Ferrari’s for himself, Brenny Nat and Christopher. We Press on everyday because of Markell and his cheerful courage. …. At least that’s my belief, and I pray the belief of those who have communicated in some form or fashion that the Carepage and Blog updates about Brennan have been missing. Officially, the Carepage updates are over; however, with the new medium of our Press On website, and the Blog post section designed for the specific purpose of providing updates on Brennan, his health and status, I figure that we’ve laid off for long enough. To be honest, I had always envisioned the Carepages coming to a close someday, with positive news of Brennan’s remission, back to school, normal kid’s activities, etc. And, if I did my job right, the last entry implied such, letting everyone know that he is home, growing stronger and happy reintegrating himself back into the world that he has only been able to experience from his dreams, and through the windows of hospital rooms and temporary housing. But we also intended the last entry to communicate that most all future blog posts would be directed by Press On and, therefore, our life’s mission to find cures for AML and neuroblastoma. That is now our central civic related purpose, and the purpose of this website. But while Brennan has achieved so much, and Press On has grown beyond our most liberal projections, I’ve determined that it is easier to communicate our mission as well through Brennan’s ongoing journal as it is through reports on new Press On initiatives (Whatever you play, play for Press On [see article below] via Play for Patrick, One Spare Week, the Press On Store, grants to the Pediatric Genome Project and CHOA’s Radiation Therapy programs, and news regarding accolades we as a Press On family have received, and graciously accepted, for making an impact in the world of pediatric cancer in such a short time.). I begin this blog with heavy contemplation, peering through the window of Grizzly House on the St.Jude campus as the sun set’s over the silhouetted Great Pyramid of Memphis, that monolithic mirrored architectural oddity that served as an ethereal monument and conduit of hope and energy through the windows of the Chili’s Care transplant center for the best of three years. I recognize that almost exactly three years ago I sat in the room adjacent to this one, with Brennan and Tara at my side, looking at the sunset and wondering where in the world life was taking us. There was so much unknown then. So much to achieve. Yet while we now know so much more and have achieved so much, little has changed in the realm of wonder. Peering back through the years, a project which had been initiated with sometimes harsh reminders of experiences pushed into the closet of abstraction, these recollections are currently shuffling back through my memory, sequentially and day-to-day, as I make an effort to totally review, correct and edit, as necessary, the entire collection of Carepages for possible publication (per the request of countless people who have convinced me that the collection of posts can indeed be helpful to families enduring what we have experienced). The effort indeed has nearly become all consuming, a surprisingly emotional journey backwards through the specifics of life experiences, many details of which I have subconsciously relegated to the closet. I am daily surprised to uncover details of our past daily life pushed away from my mind when re-reading these pages (all 650 something of them). But staring at the sunset of the mirrored Pyramid, downtown Memphis and the bridge across the great river to the west, I am brushing away tears generated from a long day at the clinic, and subtle recollections from visits with old friends and intense reflections on past circumstances that harshly thrust me back into the mode of hyper-focus that can only be experienced at a place like this. I do not know how many clinic visits we’ve had back to Memphis since our last blog entry; but, to recap, over the summer we’ve regressed from a 90-day clinic cycle to a once, and sometimes twice, monthly cycle of St. Jude clinic visits with Brennan’s diagnoses of Chronic Graph Versus Host Disease (CGVHD), which had manifest itself over the earlier part of the summer through a number of subtle symptoms (including: joint stiffness and inflexibility, mouth sores and extreme dry and flaky skin on his hands and feet). We are more than pleased that he has trudged through the symptoms associated with his digestive system, and that he is now, for the most part, eating like a normal kid and is maintaining his weight around 23 kilos (a bit on the light side for a 10 year-old, but he is steady and we are cool with that). With the digestive problems behind him, there are other symptoms, much more subtle but entirely more real with regard to the confirmation of CGHVD. Last month the symptoms were serious enough that he was put back on a daily does of MMF, which his a light dose oral chemotherapy designed to keep the GVHD symptoms from worsening. Of course, Chronic GHVD is the number 1 killer of bone marrow transplant patients, second to relapse. Because Brennan has demonstrated GVHD symptoms since transplant 4, we are comforted that a relapse is very unlikely, (GVHD is a sort of insurance policy which recognizes his cancer as the enemy and has seemingly conquered it ; therefore, even AML relapse is unlikely, which can be a secondary cancer to many of the various chemotherapies he has endured); however, we now know enough kids, and enough stories, that the chronic version of GVHD can be a long, painful and debilitating disease, while creakily opening life’s final door. Fortunately, Brennan’ case is early and seems to be under control. The purpose of this trip was to see how the MMF, physical therapy and nutrition were affecting his status as a CGHVD patient. It is currently the ultimate barometer for his overall health and long term prognosis. And, preparing for his first full year of school since 2008, it is necessary for us to obtain a firm grasp on both his strengths and limitations. We landed in Memphis the night before at 2am, having missed flights due to weather, etc. And we woke groggily early the same morning to an ominous display of weather, of intense lightening and driving rain. Our triage appointment was only at 9am , but waking a tired boy at 8:30 who had just fallen asleep a few hours earlier rendered our registration barely on time, wet and foggy headed. I guess most patient families were also a little late for their appointments that morning, as I thought back to our countless tardies from the days traveling to and from the hospital from our temporary housing in every kind of bad weather. The waiting area outside of triage was standing room only. I recognized no one, except through the ubiquitous blue face-masks adorning the leukemia patients, and the tired painful looks of kids that were clearly in the midst of chemo or post transplant. Their identities were new. Their expressions, the same. Brennan seemed oblivious to it all as he played iPad solitaire next to me while I watched a mom stroke the remaining hair of her early teenage son, almost totally emaciated and staring at the wall blankly with his head doubled over into the lap of his wheel chair. Called back to triage, the wall of Brennan’s assessment room had a clip of bar-coded stickers literally from the top of the door jam to the floor, each one representing a different vial of blood work necessary for his monthly assessment. “Ok then.” She said as she prepared the new “J Tip” pain free IV needle device, quickly popping a gun-burst of cold air at his little arm, an effective new numbing tool for pediatric needle sticks. “What do you know, I blew the vein. I’ve never seen that before with a J-Tip,” she said, as she called another nurse in to see what had happened. Brennan started to tense up a bit and squeezed by hand. We tried the J-Tip again on the right arm, and got the needle in, but the vein rolled over and we got nothing. This time it hurt and Brenny started to cry. “We can try this one more time, because we are only allowed to use the J tip three time per day per patient,” she said, then we’ll have to try the old fashion way. “Bang,” came another blast of compressed air. Another stick. More tears and no success. This entire process had dragged out to about half an hour and we were beginning to be late for his next appointment, so the nurses put lidocaine ointment on his arms, in preparation for a try later on as we made it to Brennan’s pulmonary function and eye examinations, hopefully allowing the numbing cream time to do its thing before coming back. In addition to the floor length list of labs for the day, Brennan was also scheduled for a phlebotomy, which represents the monthly letting of about a pint of blood or more in order to physically remove the surplus iron content in his blood, a residual side-effect of having had so many blood transfusions in the past. We moved on keeping things on schedule, but getting the IV in sooner or later was critical for our stay’s purpose. We arrived at the assessment room with Brennan still shaking from the tears. Earlier this year he blazed through this exam with much success. Indeed, the success of his previous test was so good that the doctors saw his lung recovery as yet another miracle upon miracles. Today, however, was not to yield the same results. In fact, we were to learn upon completion of the report, that his performance markedly had dropped. I’ve seen these pictures a dozen times, as Brennan has sat in this booth, either trying to prove that he was strong enough for transplants 2, 3 or 4 or simply trying to show that he is getting better. This time, of course was the latter; however, looking at my little hero try his best with tears still present from earlier, I got up and walked out of the room for a moment. There was way too much weird mojo going on this day, whether from, the lightening storms outside; the flashbacks triggered by my surroundings; or the simple fact that, while our trials are different now, they are still hard, long and tough on this little guy. I am so proud of his ability to Press On; but I am also getting way tired and probably more emotional about things than when we were in the thick of battle, when the mind did not have time to wander. Without getting too bogged down in the details of what was a clearly a tough clinic visit (9 am well past past 6pm), let’s suffice it to say that it was a long day, and we remain on slate for a lot more, every month, for the foreseeable future. Brennan’s eye examination revealed the new presence of cataracts. I am told that this is not GVHD related, but most likely a result of the total body irradiation he received prior to transplant 2. They are small and, currently not affecting his vision in any negative way. But, then again, they are something new and represent yet another straw on the stack that has yet to see its last. Triage for blood work the second time (after the eye and pulmonary exams) was even more painful than the first. We got enough blood for about half his labs, including major chemistries for his clinic evaluation and the all important chimerism test (which will show the status of his graph), but the veins were just too flat and did not produce enough for us to keep in the IV for the phlebotomy. That too had to wait until the last deed of the day when, after his 7th stick around 4:30 pm, they finally got the blood flowing. We were told by Brennan’s clinic Dr. that he was most likely not hydrated enough earlier in the day, having come straight from bed; but then again, having had ports or central lines from which to draw this stuff for the last number of years, we are still learning these little tricks of the trade for blood letting. We’ll try this trick next month. If he has to suffer through another full day of this treatment again, we may ask about the pros and cons of a port, as the phlebotomies and blood work will be a regular part of his life for at least the next couple of years if not more. On the CGHVD front, we see some good signs and some uncertain ones. His skin is better and he is noticeably stronger, thanks to a regular workout schedule with our training buddy Craig Bryan from Augusta. We are told that joints in GVHD patients can atrophy to the point of no return, leaving some people unable to hold a spoon or groom themselves. He enjoys his work outs with Craig, which are much more fun that a PT appointment inside a medical facility. Consequently, our success from last month was significant enough to chart, so we will stay on this path with vigilance for as long as we need to. RE: the oral chemo, well we’re going to be taking this stuff for at least 6 months, probably a year or more. Not our favorite part of the daily routine, considering first of all that it is poison, and maybe equally so that it limits his immature little immune system. This is not something to take lightly considering that we are starting school full time for the first time since 1st grade (he starts 5th in two weeks); and, being just over a year and a half out of transplant, he is just now getting his immunizations, With his new immune system comes new shots just like any new born babe. And, unlike all of the other 5th graders, he is virtually naked from an immunological perspective. But all of this would be the case with or without the chemo. And if these drugs keep his immune system from going haywire, well… Just another straw on the pile. On the bright side, he looks great. His skin is getting better and he is truly getting stronger. His trainer, Craig, was very anxious to hear what the PT folks thought about him, having taken base line thresholds from him in July; and, in virtually every category he has shown improvement or at least no further deterioration. In the world of CGHVD, same is good, and remains the primary reason that we are not considering changing the chemo regimen any time soon. At home, he loves the physical therapy and strength training. I remember how self conscious I used to be as a skinny kid in the gym trying to work out among the healthier specimens of the world; but Brenny thinks nothing of it. If anything, he lifts every weight and grinds through every stretch with a slight prideful smile and an intensity of determination as much as any big time body builder. And he has been to Camp for the first time in his life, finally getting the green light from his doctors to participate in Camp Rainbow, which his little brother Christopher attended with him with much pride and delight from both. It was a liberating week for him, and despite the over-sufficient staffing of nurses and doctors at this yearly gathering of pediatric cancer patients survivors in the woods of central Georgia, was also very odd for me and Tara to be totally incommunicado with him for a full week, having been at his side literally every moment for three and a half years. He plays ping pong with his friends daily. He swims (in the right solar conditions) and he plays golf, even attempting to play in four regional junior tour events (although his sweat glands have been compromised and the brutal summer heat has simply made it too difficult for him to finish). But even though he may not be in the pool all day, or finishing every tournament, he tries and he does so with cheerfulness and vigor. What has gotten him this far is what is taking him to whatever level lay ahead. As the day wore down for our monthly St. Jude clinic visit, we finally navigated his way though the difficult part of the day. I quietly began processing the new news with the old, and we both openly took time to process the things and people of this place that have and continue to make a difference in our lives. One of the simplest pleasures of being there was just being there. Brennan had been in isolation for about two years because he has tested positive for VRE since transplant 2, and has therefore been quarantined from the general hospital population. Being able to walk around the hospital now that he has cleared the VRE, talk with other doctors and specialists, visit the cafeteria and the gift shops is a simple yet very meaningful milestone. And it was in the cafeteria that he ran into his old transplant child-life specialist, Ashley, who, after careful consideration, obtained permission for us to visit the transplant floor for the purpose of seeing the 1,000 Origami Cranes dedicated to him by the middle schoolers at Maria Montessori School after transplant 3. The transplant floor is always off limits to any patients other than those admitted to the floor at any given time. But, given that Brennan is party to a major work of art adorning the hallways, we received dispensation from the on-call transplant physician for a quick photo of the paper birds, each of which was made as tribute to him with the prayerful intention for healing. They now remain for the healing of every child who passes their way every day. We are constantly amazed by the families who remark that this piece of art is one of the most memorable and inspiring they have ever seen. Walking out we could not help but think and talk about the other kids we know and knew from that floor. One in particular, Andre Colletti, who passed away just a month earlier, had always been a true shining light for Brennan. Being one of the most cheerful kids we every meet, combined with the fact that he had all of the characteristics of a dashing and confident older teenager, had always boosted Brennan with words of encouragement and the “thumbs up” at every little encounter. Walking down the corridor for the final time that day, Brennan and I stopped to observe one more piece of art. It was a framed poem by Andre, with a photo showing his beaming and loving smile, shining even brighter through the dark jaundice of GVHD. I held Brennan as we read his poem out loud to each other. “He was a brave kid wasn’t he daddy?” Brennan asked. “Yep,” I said as I held his hand and we walked out the front door to see the sunset through our room at Grizzly House. With such a day spinning through my head, and Andre’s words still only minutes fresh, sitting on the bed at Grizzly watching the sunset over the pyramid, I guess it is only natural that my mood was on the introspective side of things. As we finally packed to leave, we played some Galaga in the playroom downstairs, enjoyed some dinner on Beale Street with our dear friends, the Lackies, and picked up a gift for a close friend who has found his way back to St. Jude because of relapse. Markell Gregoire had just had his stitches removed where the new prosthesis had been installed a couple few weeks prior near his mid-thigh. We last ran into Markell in July when they attempted to remove the returned cancer from his muscle, but the margins were not right and he eventually had to sacrifice his leg. In July, we were able to visit with him and all of his family during that trip, telling him to keep his chin up, as he always has. Now, in August, knowing what he had just endured, we needed to see him before returning home. Indeed he does. After our dinner, we arrived at Ronald McDonald House to see his text book smile there like always. But he was understandably more reserved than usual, as was his mom. We certainly know what they feel like, dealing with relapse, and the older you get the more real all the heavy stuff feels. Shaking his good leg nervously as he shuffled through a luxury sports car magazine, he pointed out the gull-wing Ferrari that he was going to get one day. “That’s right,” I told him. “Keep your mind on the good things and you’ve got nothing to complain about, right?” I said instinctively. “I got a right to complain,” he said back looking at me with as much seriousness as I have ever seen. He then switched his smile back on, flipped another page and showed me a picture of four red Ferraris. I think reconnecting to our Press On supporters indirectly through our experience, and through our best effort to communicate the experiences of these kids, may be the most effective means of explaining why it is that we Press On, and why we are now dedicating virtually every moment of our outside lives to Press On and its mission. We have so much to report, and so many interesting and heartwarming stories. The Taxslayer/JR Motorsport dedication of the number 44 race Car to Press On for two Nascar races this season, and now the Taxslayer Play for Press On golf tournament in September, are both big news items that will soon have their own space in these e-letter pages. Likewise, the fact that we have now raised and granted over $1 million for pediatric cancer research and have become in just a few short years one of the most respected and effective grass roots pediatric cancer funds in the world is something to talk about. And our investment in CURES and programs that are making international news, such as the Washington University/St. Jude pediatric human genome study; the new MIBG facility at CHOA’s Emory campus for Neuroblastoma; and the participation in a larger parent driven coalition of funding at Memorial Sloan Kettering Cancer Institute for Turbo 3F8 (a human based mono-clonal antibody that may help prevent relapsed neuroblastoma). I’ve been involved with a lot of organizations in my adult life, all with meaning, all with good cause. But every time I reconnect with an old friend like Markell, think about and pray for the soul of an angel like Andre, or Patrick, or Cassidy, or Jack, or… I reconnect with the reason of why we Press On. I pray to every source that has kept me going throughout all of this, and ask that my focus never waver. And I say “thanks,” to God and for all of those who Press On with us, beside us and in-spite of it all. Totally, the most important factor that is mature while purchasing medicaments from the Web is to make a best choice. To purchase medicaments online from a preferred web-site is safe. Other medicaments are used to treat complaints such as hair loss. What about buy propecia online and alopecia? Very likely every adult has heard about buy propecia. (Read more finasteride online). A extended medic state present is hair loss. What physic does treat alopecia? Most of patients using this physic mostly do not have any side effects to Finasteride. Even if this drug is not for use in women, it is not known whether this generic could mischief a nursing baby. Thanks for the update. It’s great to hear about the summer. You guys are awesome. Congrats on all the success with Press On. Hope to catch up with you guys on one of these Memphis trips. Thank you for the update, Turner. We keep Pressing On with you. Hughes and I look forward to teeing it up for Press On in the Garden City in September. Thanks, Turner, for the update. I look forward to more news of Brennan’s progress. Even though we have never met, my family has been praying for Brennan for years. It was a special treat for my son who was visiting his Aunt Lisa in Augusta to see Brennan at the pool one day. For him to be able to see that prayer really does work and see Brennan in the flesh was a wonderful experience. Thanks again for sharing your beautiful story. Thank you for the update, Turner. With you and Brennan in spirit on the journey. -from Atlanta. Soooo good to read and experience your thoughts and insights again. Another battle fought and won. The war is still on and we are your prayer warriors. Brennan is so brave and yet so vulnerable. He is a true miracle and inspiration to my family. Hope to see you in September. Press On! of yours really means a great deal to me. Please know many, many people are praying for that precious child. People you have never met, people you will never meet. God is everywhere and so are his people!!! My heart hurts when I read about Brenny hurting and crying. I’m so very sorry for the pain he (and his parents) must endure with the damned cancer. I’m praying for a successful outcome of future clinic visits. I’m hoping Brenny gets to have a full year of real school with his friends. You all remain in my prayers. God bless! And thanks, Turner, for keeping us updated. The love, openness and honesty that you so generously share with us all is humbling. You are all so special. Love and Hugs to the whole family. Love and prayers go out to all who are a part of this mission. that all of you have shown. You are all in my prayers, as always.